Lawrence Donoghue is a practical, results oriented labor and employment lawyer with over 30 years of experience advising businesses and executives in issues governed by federal, state and local law. Subjects include policy compliance, HR audits, government investigations of corporate employment practices, EEOC proceedings and litigation, NLRB union campaigns, collective bargaining negotiations, employment contracts, severance agreements, corporate confidentiality and non-compete agreements. 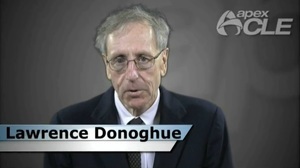 Mr.Donoghue graduated from Georgetown University with a Bachelor of Arts in English. From there he went to Loyola University of Chicago, School of Law to obtain his law degree. He was admitted into the Illinois Bar Association in 1978 and the U.S. District Court of the Northern District of Illinois also in 1978.